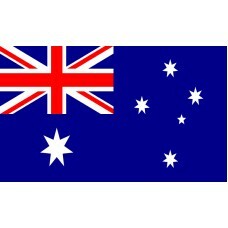 The Australian flag features a blue background with the Union Jack emblazoned in the top left corner. The bottom left corner features a 7-pointed star and in the middle of the flag are five small white stars. The Union Jack on the flag represents Australia's connection with Great Britain, the 7-pointed star symbolizes the 6 states and the territories in Australia's commonwealth and the five stars are a reference to the Southern Cross constellation, which can only be seen in Australia. Australia which is also known as the "island continent" is the 6th largest country in the world and the only continent-nation as it is fully surrounded by ocean. It officially became a country on January 1st 1901, and its name was changed to the "Commonwealth of Australia." It became a country when the six British colonies of Queensland, Victoria, New South Wales, South Australia, Western Australia and Tasmania united. This process was known as the "Federation of Australia." Before the commonwealth was formed, Australia was using Great Britain's flag as its own and the Queen of England was the head of state. Following the Federation, the commonwealth government held a competition to design Australia’s national flag with a prize of $200. Five people were deemed winners of the competition, as they all submitted designs which were almost identical. The Australian flag was first flown on September 3rd 1901, in Melbourne and since then, National Flag Day is celebrated every year on this date. Initially, the "commonwealth star" on the flag only had 6 points to represent the states but in 1908, an extra point was included on the star to also represent the territories. This change did not become official until 1954. In addition to the national flag, there is an Aboriginal flag, the Royal Australian Navy has its own flag, as do the Royal Australian Air-Force, the Queen of Australia and the Governor-General of Australia. With this in mind, the national flag is still the most important flag in Australia and when it is raised, flown or lowered, people must face the flag in silence. 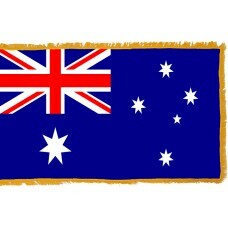 The flag signifies Australian's identity and pride. There is still debates in Australia regarding the Union Jack on the flag as many Australians want to separate the connections with Great Britain and be their own independent country. There was a vote in 1999 which resulted in the separation being denied. Australia is one of the wealthiest countries and much of its economy is due to tourism. It is home to some of amazing attractions (there are 19 listed World Heritage properties) including the Sydney Opera House, the Great Barrier Reef, Fraser Island, Bondi Beach and Kakadu National Park. Tourism has been increasing each year with over 8.7 million visitors in 2017.